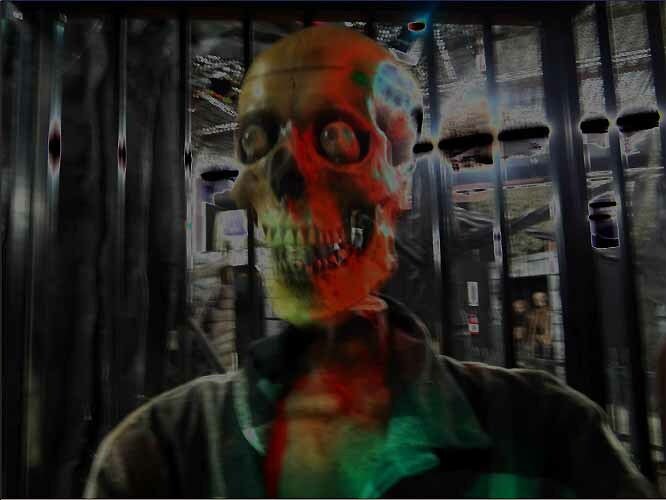 Hollywood Gothique has been extolling the virtues of The Reign of Terror Haunted House for so long that it seems as if there is nothing more to say. Therefore, we will be brief regarding the Halloween 2014 incarnation, which we visited last night. Here are the key points. Over the course of the preceding six weeks, we have been to every major Halloween theme park in Los Angeles and numerous other haunted attractions as well, wandering through dozens of horrifying labyrinths and catacombs - and yet, upon entering Reign of Terror, that past experience melted away into vaprous ectoplasm - a dim, insubstantial mist - erased by the magnificent variety of paranormal activity on view in the Reign of Terror's five sections. Far from an enervated feeling of "been there, done that," we found ourselves re-energized and having as much fun as if going through our first haunt of the season. Like a star performer, Reign of Terror truly is good enough to follow all those other haunts and make them look like mere warm-up acts; no matter how much you have already seen, this is one you have been waiting for. Don't take our word for it - the paying public agrees! Thursday was a relatively slow night, and we suspect that fewer live monsters were haunting the corridors, leaving mechanical props to provide most of the scares. 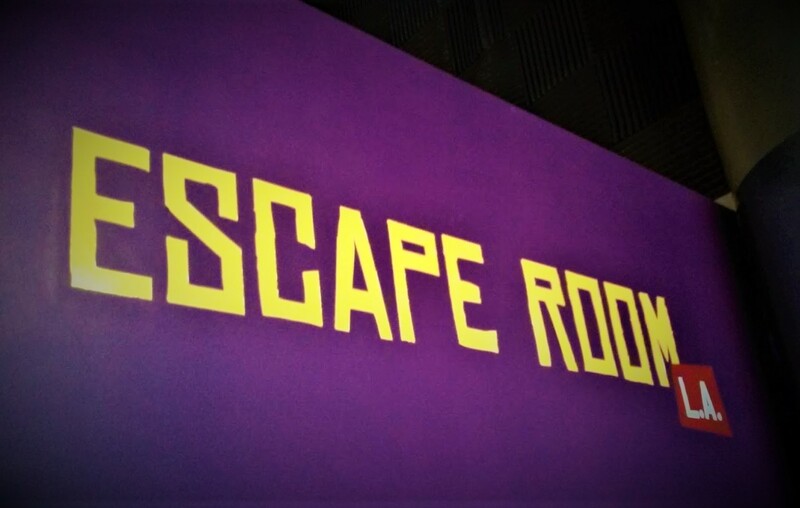 Nevertheless, the group behind us were screaming their heads of in fear from start to finish, eager to run out and escape the torment - but unable to do so, because we were blocking the way. And here's the kicker: Emerging through a door that resembled an exit, a girl behind us exhaled in relief, "That was great!" She obviously felt she had gotten her money's worth, but what she didn't realize was that the "exit" was actually a passage to another section of the haunt, the Asylum. In other words, she felt as if she had had a completely satisfying haunt experience, and the haunt was only half-over! 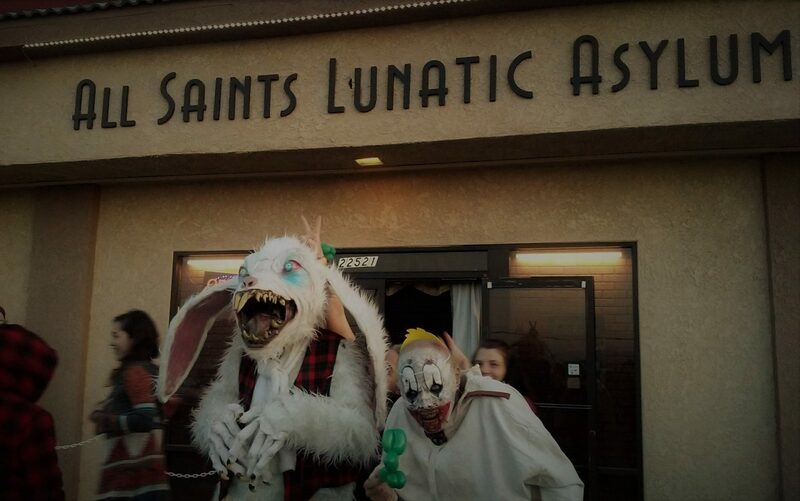 Can any other haunted house in Los Angeles, Ventura, or Riverside make that claim? Standing in Line is Half the Fun! Sure, you want that VIP fast pass so that you can bypass the line and get to the good stuff - but much of the good stuff is on view while you are standing in line. After heading up the stairs above Gold's Gym, you will be confronted with two lines: fast pass and general admission. 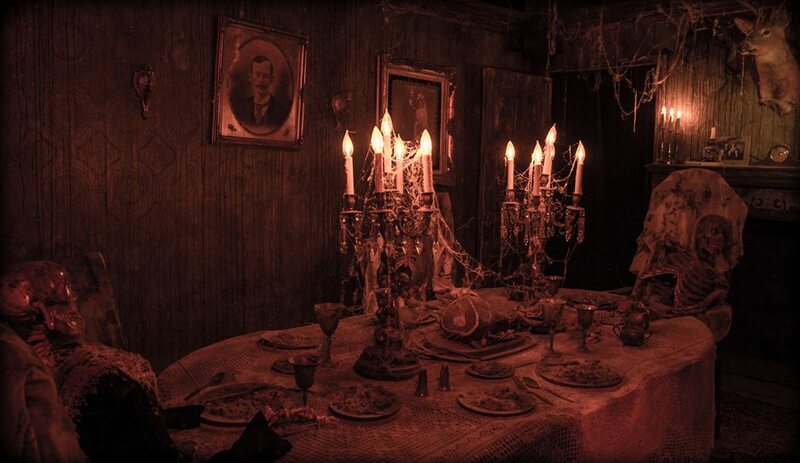 The general admission line threads through spooky sets filled with skeletons that pop out of coffins and rattling their cages; strange figures in rocking chairs; a "lost souls" saloon; and a body that drops from the gallows. These tableau - with their wooden, rustic look - the stage for the the first section you encounter upon entering the haunt proper: Miner's Revenge. It's as if you have walked through the haunted remnants of an old Western ghost town and now you are descending into the rickety gold mine, where even darker terrors await. Reign of Terror has expanded again and again over the past few years, but it manages the incredible feat of growing with stretching thin. 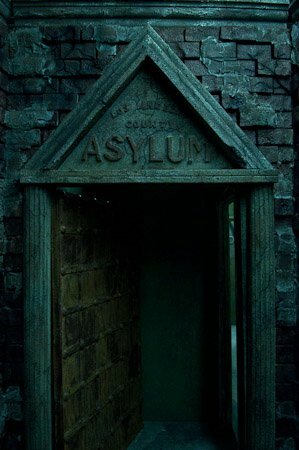 The haunt's original Victorian Mansion - an old-school haunted house - remains as spooky as ever, pure in its supernatural approach to Halloween horrors; other sections provide a variety of more visceral thrills, including Friday the 13th-style slaughter in Blood Manor and some graphic open-heart surgery in Quarantine. There truly is something for everyone, and as a movie ad campaign proclaimed long ago, "If this one doesn't scare you, you're already dead." Reign of Terror will be open tonight and tomorrow October 31, from 7pm until 11pm on Saturdays. Tickets are $17 for General Admission, $25 for Express Line (limited or no waiting). The haunt is located in the Janss Marketplace, above Gold’s Gym, at 197 North Moorpark Road in Thousand Oaks. Click here for their website.